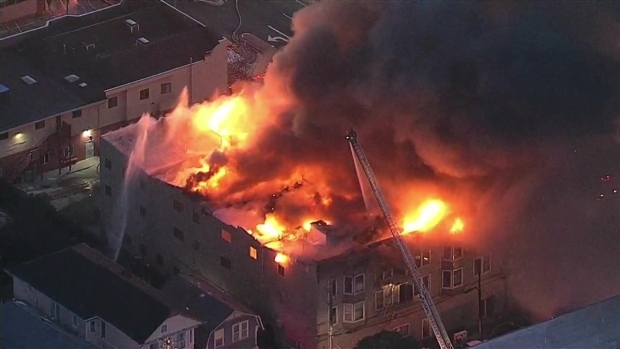 Three people died and seven people were rescued Monday after a massive blaze ignited inside an Oakland apartment building, which documents show was in violation of multiple fire codes and other rules. Three people suffered injuries as a result of smoke inhalation, fire officials said, adding that one person is still unaccounted for. The Alameda County Coroner's Office identified one of the victims as 64-year-old Edwarn Anderson, of Oakland. "I just heard screaming and breaking glass, sounds of wood breaking and explosions," resident Kirstin Evans said. "I looked at my window and it was all orange and yellow. I ran out of my apartment and it was all smoky and debris was all over the place." The four-alarm blaze, which was reported around 6 a.m. at 2551 San Pablo Ave., triggered "multiple rescues," fire officials said. Heavy flames and smoke could be seen spewing from the building. 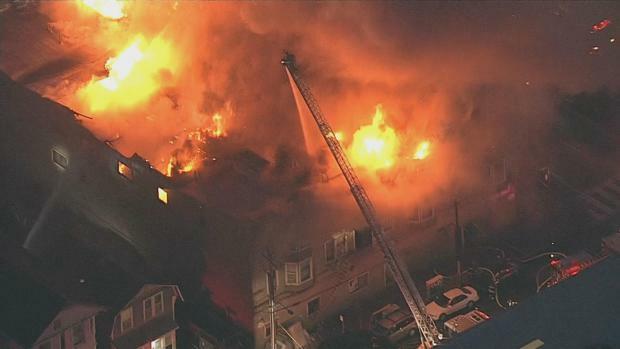 Seven people were pulled from the burning building, which is believed to house more than 80 people, according to Oakland Fire Department Battalion Chief Eric Logan. Several people were hanging out of windows when first responders arrived, fire officials said. Resident Tarub Smith grabbed her girls at about 5:40 Monday morning and got out before the three-story building collapsed. "Scary chaos, people screaming, windows breaking, flames, smoke in hallways," Smith said, describing the scene. "The landlord was using the Ghost Ship fire as a reason to evict them," Cook said. "And it's suddenly convenient that the building is now on fire. It's like Ghost Ship, but worse." "There were no sprinklers or fire extinguishers," said Curtis Robinson, 52, who had to leave his wheelchair behind in his first floor room in the scramble to escape. Several residents said they discounted the initial commotion over the fire because the building and neighborhood are noisy. Loud arguments occur frequently, and some residents stayed up late, drinking and partying. Kirsten Evans, 52, said she paid $1,100 a month for a small studio apartment without a kitchen. She said she moved in three years ago after she was evicted from her apartment of 20 years because her landlord wanted to raise her rent dramatically. She said she woke up briefly Monday to take her medication and heard yelling and screaming. Then she heard windows popping, shattering from the heat and a skylight overhead shattering and glass falling outside her door. As she fled, Evans said she trampled over broken glass as wires and light fixtures sparked red and white. "I didn't hear a fire alarm," she said. 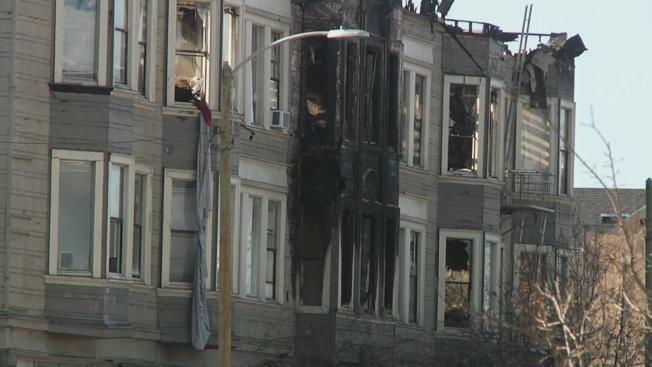 Awakened by screams of "fire," Michael Jones bolted out of bed in the pre-dawn darkness Monday at the dilapidated Oakland apartment building he calls home, instinctively pounded on the doors of his elderly neighbors and ushered them to safety — walkers and all. Jones, 43, then found Princess, the "house" pit bull, cowering in the backyard, and the two ran out the front door as glass shattered from the heat. A few hours later, he and the dog stood across the street, staring at the smoldering wooden structure that housed some 80 low-income residents, many of whom complained that they had not heard alarms, felt sprinklers or found fire extinguishers as they fled the substandard living conditions. Jones said a prayer of gratitude for surviving the fire that killed three people and hurt three others, including two children. One person remained unaccounted for as of Monday evening. "At least the rats are gone," said Angela Taylor, 62, clutching her purse, the only possession she managed to get out of a room she paid $550 a month to live in. "It's the wrong purse, but it's better than nothing. A lady needs her purse." Bobby Earl Bishop, Jr. was sleeping on the first floor when he heard one of his neighbors yell, "Fire!" He initially thought it was a joke until he recognized the smell of smoke. Bishop and his wife managed to escape the inferno with just minutes to spare. "I'm doing OK," Bishop said. "I'm mad I just lost my place. Me and my wife just lost everything. We only had a little bit of stuff, and we lost everything." During their initial search and rescue efforts, firefighters reported seeing a person on the third floor of the building, but they were unable to reach the person due to heavy flames and smoke, Logan said. Fire officials later confirmed that one body was located. Firefighters were quickly pulled from the structure for safety concerns, forcing them to battle the flames from the ground and via extended ladders, according to fire officials. Roughly one hour after the blaze ignited, crews appeared to gain an upper hand in the fight. Large clusters of flames were replaced by billowing plumes of white smoke. Firefighters also managed to contain the flames to the structure involved. After fleeing the fire and receiving services from the Red Cross, several residents voiced their frustrations with their burned home. Irene Randall said the apartment building was "unlivable." "This building has not been right for a long time," she said. "This definitely could have been prevented." She claimed the building was infested with bed bugs, rats and cockroaches. Fellow resident Darlene Jones added that the building only had one way in and out — a staircase in the front of the building with a metal gate. Randall and Jones, along with resident Justin Wash, also claimed that the fire sprinklers in the building did not go off during the fire. "I don't know how this building came up to code," Wash said. The Red Cross and the Salvation Army were helping as many as 80 people with meals and a place to sleep Monday night. NBC Bay Area's Jean Elle and the Associated Press contributed to this report.